31DC2013 Day 6- Violet Nails! 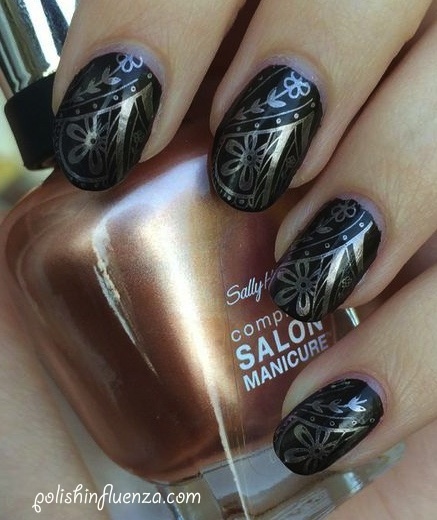 The purple polish I have today still has an art design built into it- it’s a magnetic polish! The polish’s name is Purple Jam, and it’s by Live, Love, Dream by Aeropostale stores. It’s a really red based purple metallic polish that fits its name perfectly- it looks like grape jam! I totally think of peanut butter and jelly sandwiches, lol. It comes with a chevron patterned magnet. In order to work it, you hold it over the wet nail polish for about 10-15 seconds (without letting the magnet touch the nail polish, of course) and the remove it to reveal a black chevron! 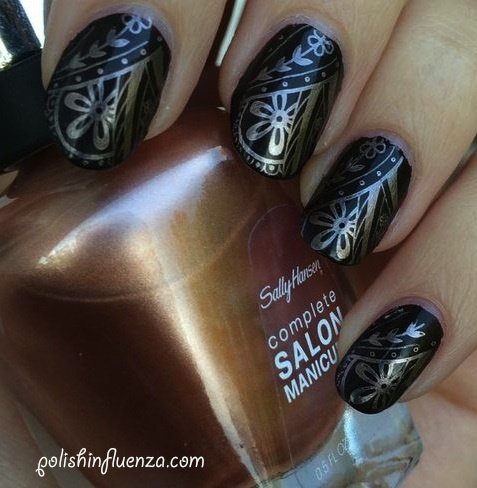 The magnetic particles in the nail polish all pull towards the magnet, creating the pattern. The polish itself is very opaque, it’s almost perfect in one coat! Brushstrokes are a bit of an issue, but the magnetic design hides that. The only real problem is that it has some sort of a “grainy” texture, like bubbles, only smaller. One coat of topcoat seems to fix the issue. Pictures below are two coats of Purple Jam, with Sally Hansen Diamond Strength Nail Color in Flawless as a topcoat. I do like this polish, I’ve been very pleased by my Aeropostale nail polish purchases (the other recent one was Key Lime Pie, used in my Green Day 31DC2013). Aeropostale’s Live, Love, Dream Polishes are sold at Aeropostale stores, and on their website, here. I hope you like my purple nails, even though they aren’t nail art. Please share my pics if you like them, and send me your pictures of your purple nails! Click on the InLinkz below to see even more great colors! 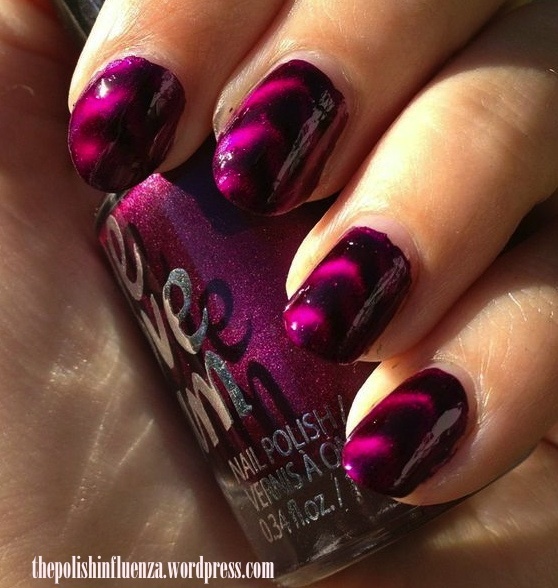 CLICK HERE TO SEE MORE NAIL ARTISTS’ VIOLET NAILS DESIGNS! Categories: 31 Day Challenge 2013, 31DC2013, Nail Art | Tags: 31DC2013, Aeropostale, Live Love Dream, magnetic, metallic, nail polish, purple | Permalink. 31DC2013 Day 4- Green Nails! Second post! Woo! I’m on a roll today, guys, this is super exciting! FINALLY WE’RE ON TO MY FAVORITE COLORS! I’m really not a fan of warm-toned colors (you’ll notice I post more glitters and cool tones like blues, greens, and purples than reds, yellows, or oranges) so knowing that the next 3 days are for cool tones really excites me! I wanted to do something fun and funky today, since I recently bought an electric lime green from Aeropostale’s beauty line, Live, Love, Dream, that I desperately wanted to try out. And what better day than green day? So let’s get to the design! I opted for a bullseye look today. On the majority of my nails, I started with 3 coats of Live, Love, Dream’s Key Lime Pie, an eye-searingly neon green/yellow that dries satin (like most neons do). Then, I used a toothpick to draw for small dots on the left side of each nail. 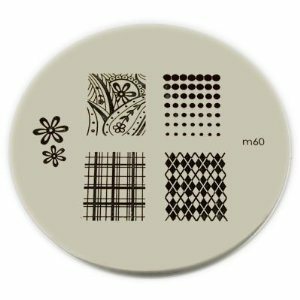 The dots were in the color 040 by Rue Beauté. 040 is a dark, blue-green, reminiscent of clover to me. I then put a dot of Key Lime Pie in the center of each dot, and then another dot of 040, to create mini bullseyes. 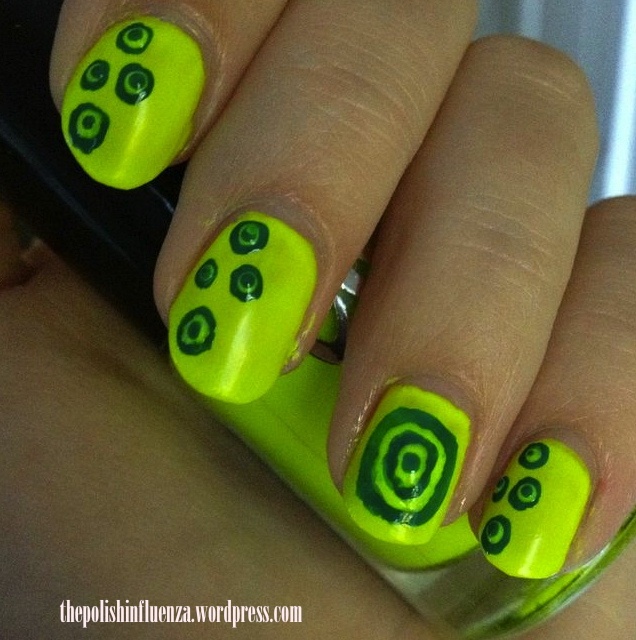 Then, for my ring finger, I alternated layers of Key Lime Pie and 040, leaving the sides unpainted to create a large bullseye over the full nail. The result is a little retro and super fun, and I seriously love these! Pics below are with no topcoat. I seriously love Key Lime Pie- it’s adorable! I’ve been looking for a good, inexpensive lime neon and I think I’ve found it! Aeropostale Nail Polishes are $6 and are found at Aeropostale stores, and on their website here. 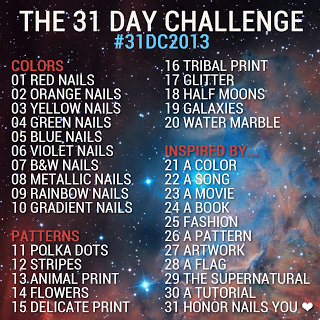 As always, please feel free to share your designs for the 31DC2013. Tweet me, Facebook message me, post your pics in the comment, or add your blog to the Inlinkz icon below. Also, please, please PLEASE share my design! Your support means everything to me, and thanks to you all, I’m up to almost 40 followers between WordPress, Facebook, Twitter, and Bloglovin’. You guys are amazing, please help me promote The Polish Influenza! Blue day tomorrow, get pumped! 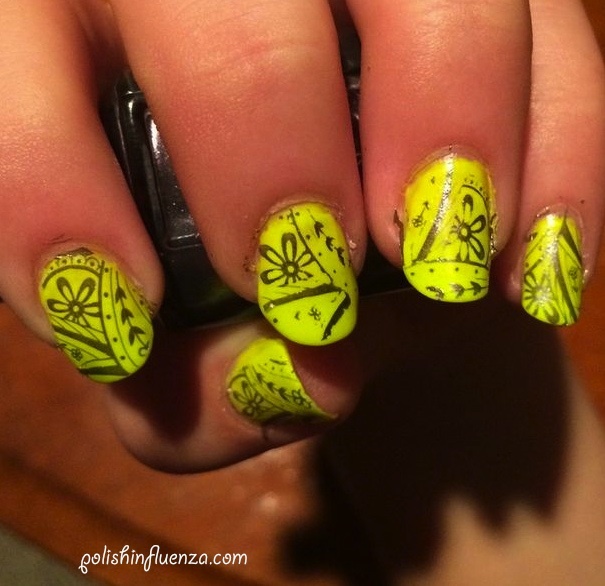 CLICK HERE TO SEE MORE NAIL ARTISTS’ GREEN NAILS DESIGNS!! 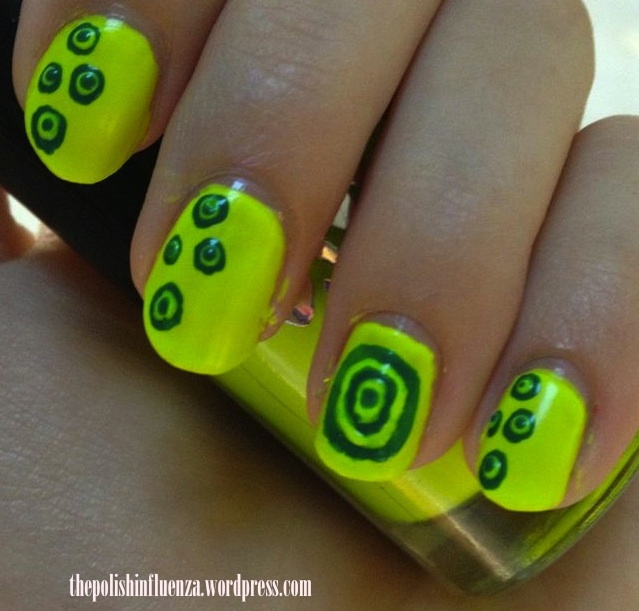 Categories: 31 Day Challenge 2013, 31DC2013, Nail Art | Tags: 31DC2013, Aeropostale, bullseye, green, Live Love Dream, nail art, nail polish, neon, Rue Beauté | Permalink.